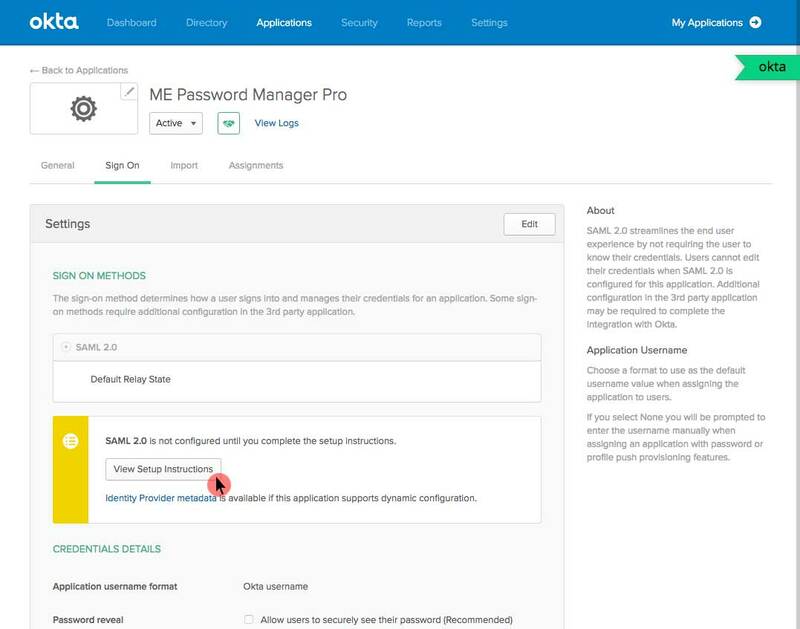 ManageEngine Password Manager Pro (PMP) offers support for SAML 2.0, which facilitates integration with Federated Identity Management Solutions for Single Sign-On. PMP acts as the Service Provider (SP) and it integrates with Identity Providers (IdP) using SAML 2.0. The integration basically involves supplying details about SP to IdP and vice-versa. 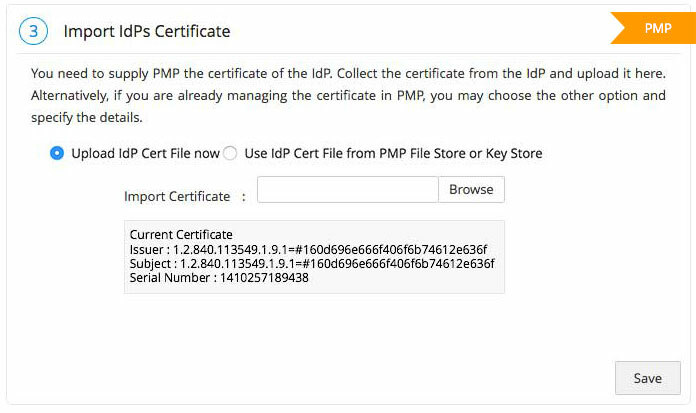 Once you integrate PMP with an IdP, the users have to just login to IdP and then, they can automatically login to PMP from the respective identity provider's GUI without having to provide credentials again. PMP supports out-of-the-box integration with Okta. 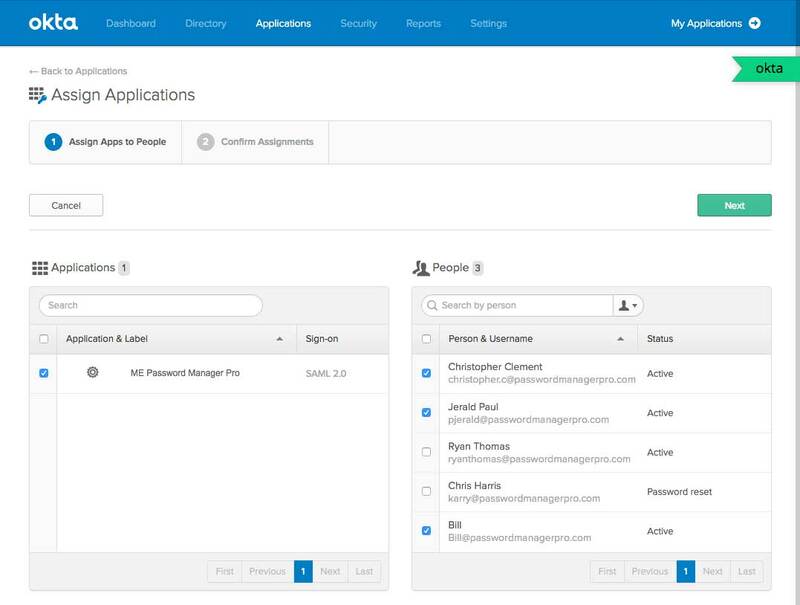 1) Adding Password Manager Pro as an application on the Okta dashboard. 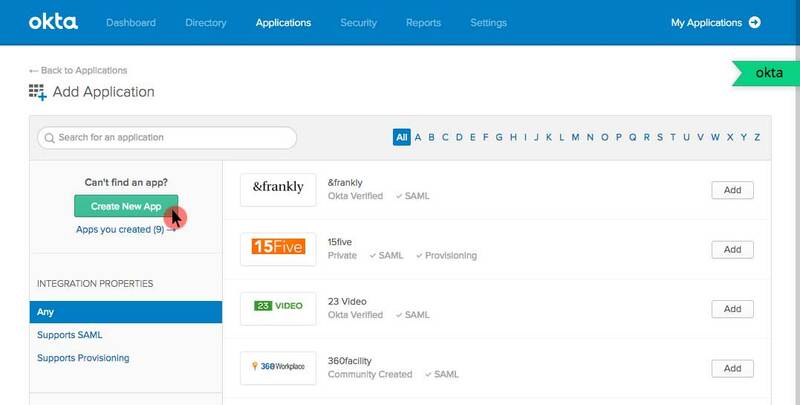 Log in to your Okta Admin account and click 'Applications' tab. In the new page that opens up, select 'Add Application'. As shown in the image below, click on 'Create New App'. Immediately, a window will pop-up asking information about the type of application integration. 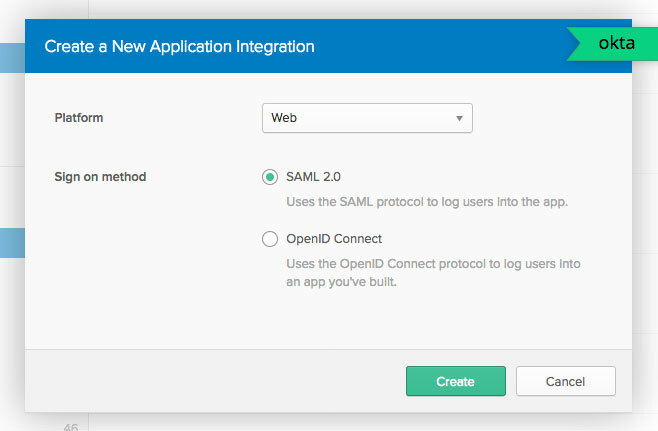 Choose ''SAML 2.0' and click 'Create'. Enter the name of the app being added (ME Password Manager Pro) as prompted under 'General Settings'. You can also optionally choose to upload a logo for the app. When you are done, click on 'Next'. 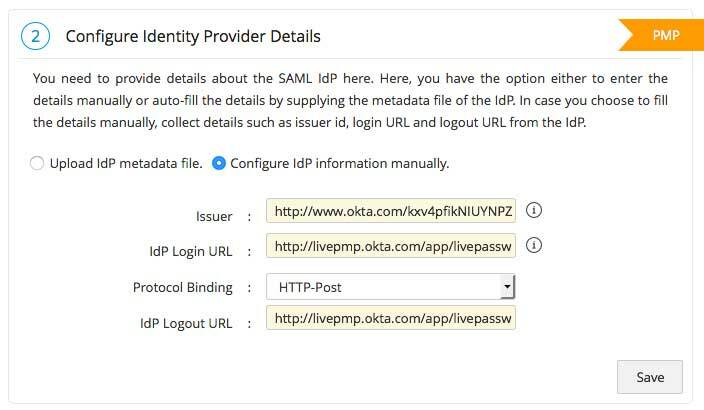 The second step in configuring SAML integration consists of providing details about the Service Provider (ME PMP) to Okta. To access these details, go to PMP Homepage and select ​Admin >> SAML Single Sign On. The area highlighted in red contains the respective details titled as 'Service Provider Details'. Input these in the corresponding fields in Okta's SAML Settings page. Scenario 2: If you have not used AD integration in PMP, you should select the option "Okta Username Prefix". This is because in Okta, user profiling is done in the format username@domain.com. But, in PMP, user names are depicted only as usernames. ​​This step is crucial because, only if you specify the correct "Name ID format" in Okta, you will be able to assign the application (PMP) to other users in Okta. Once you have filled in the required details as mentioned above, click 'Finish' to add the application. On addition, the application details will be displayed as shown in the image below. Click on 'Sign On' and then select 'View Setup instructions'. A new tab will open ​containing the details required to configure SAML 2.0 in PMP, which is discussed in the next step. You need to configure IdP details in PMP. 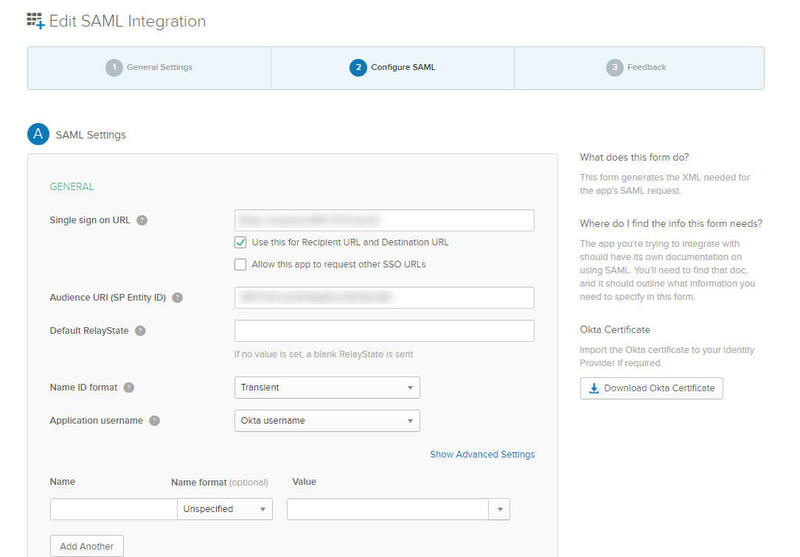 This is done as part of the second step, 'Configure Identity Provider Details' in PMP's SAML Single Sign On page. Here, you have the option either to enter the details manually or auto-fill the same by supplying the metadata file from the IdP. Manual Set-up: If ​you choose to fill the details manually, get the IdP details such as Issuer ID, Login URL, and Logout URL from the 'Setup Instructions' page of Okta. Configure the same in the step 2 given in PMP SAML Sign On configuration page. Enter the details in the corresponding fields and also download the Okta certificate and upload onto the PMP client (Listed as the 3rd step in the PMP GUI). Alternatively, you can also save the certificate file in the PMP File Store or Key Store and then use it here. 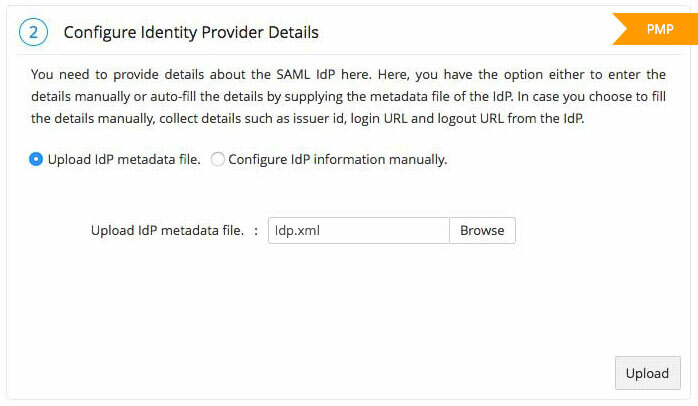 Auto-Filling with IdP Metadata File: Scroll down on the SAML 2.0 setup instructions page of Okta and you will find the IdP metadata under 'Optional'. Copy the text and ​save in a file with .xml extension. Now, upload the same .xml file onto the PMP client. ​In this case, you needn't import IdP certificate in PMP. It will be updated automatically. 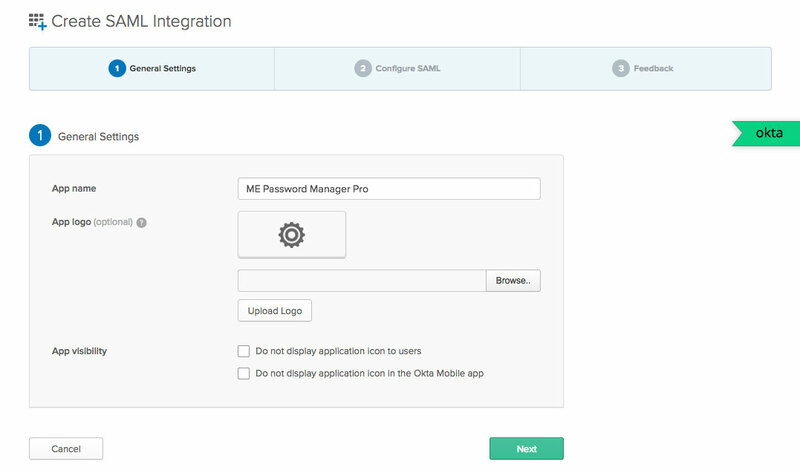 After completing the configurations in PMP, go back to Okta to assign the newly added application to your users. Navigate to Applications --> Assign Applications and select the PMP app. Under People, select the desired users and confirm assignments. 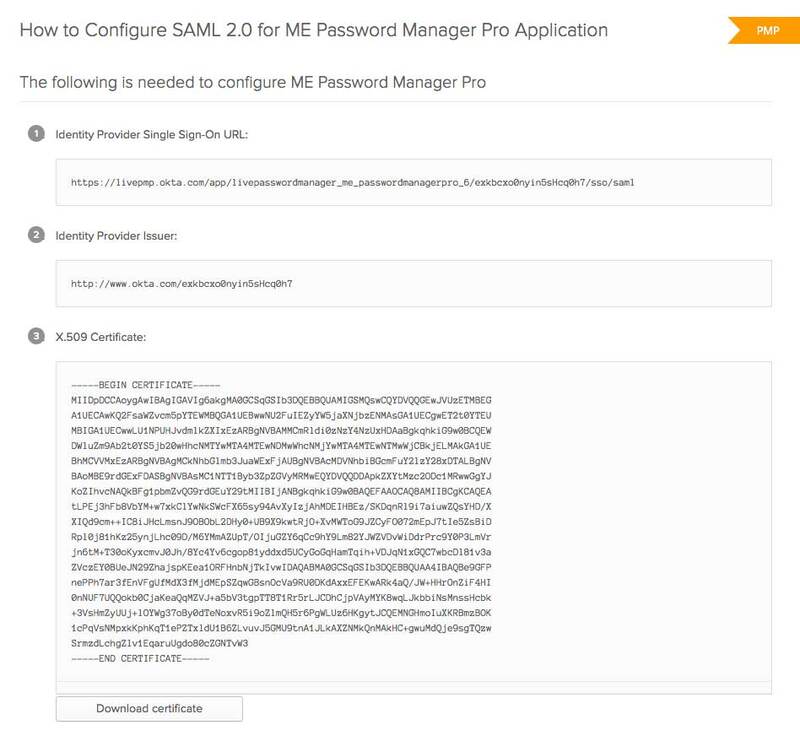 The final step of this configuration ​is enabling SAML Single Sign On in Password Manager Pro. This would be shown as the 4th step in the SAML page in PMP GUI. Click 'Enable' shown at the bottom right to ​begin using this feature. 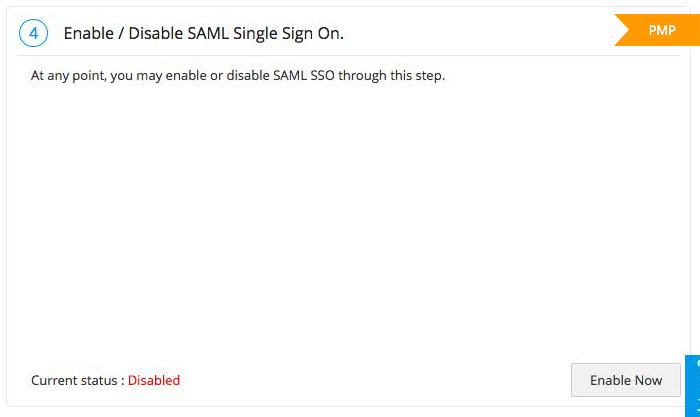 Note: In case Active Directory authentication is enabled for Password Manager Pro login, SAML SSO cannot be enabled. To disable AD authentication, go to Admin --> Active Directory.